Men’s competitor Richard Dornbush is flipping with excitement about the upcoming season. Not only will the 2011 U.S. silver medalist debut two new programs in this all important Olympic year, Dornbush also added the back flip to his exhibition programs. Dornbush first tried learning the flip with his rinks’ pulley harnesses with some help from fellow competitor Philip Warren. “Unfortunately he was a lot smaller than me at the time and we didn’t feel confident enough to try it with me,” Dornbush said. Later on, Coach Cindy Stuart stepped in and mentioned that Michael Villarreal had just learned his and would be able to help. The back flip is now a staple part of Dornbush’s exhibition program, and he enjoys performing them for audiences. 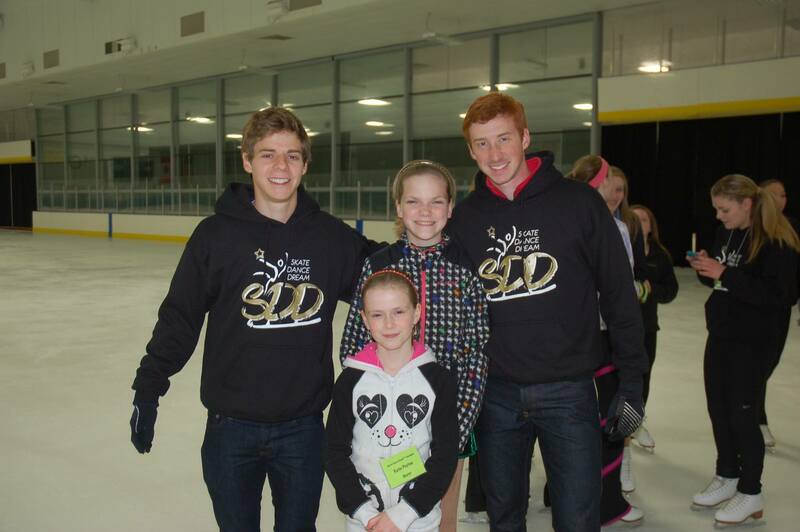 He performed his very first one at the recent Skate Dance Dream Show in Cleveland, Ohio. Dornbush is also looking forward to the upcoming season and debuting two exciting new programs. Dornbush’s long program is a Beatles medley and he loves the subtle beginning where the songs are barely recognizable, but as the program builds the music becomes more obvious. “In this way it really helps the build of the program,” he said. Dornbush is looking forward to the upcoming season, and the all important U.S. Figure Skating Championships in Boston, where the Olympic team will be chosen. “I am really excited about this upcoming Olympic season and am working very hard to earn a spot on that team. I really mean the “earn” part as I think there are so many U.S. guys that are pushing the envelope with the quads, as well as the performance part of skating, that it will certainly be, in my mind, a huge athletic feat to make it to the top group,” Dornbush said. The 2013 Four Continents Championships came to a close Sunday with Team USA winning three medals, including ice dance gold. After an exciting men’s event on Saturday night, the stage was set Sunday for great finales in pairs, ladies and ice dance. Meryl Davis and Charlie White, five-time U.S. ice dance champions, delivered a stunning free dance and received their best marks of the season. Their total of 187.36 points was three more than that of Canada’s silver medalists Tessa Virtue and Scott Moir. Madison Chock and Evan Bates, in their first Four Continents together, won the bronze medal with a season-high total of 160.42 points. Like many competitors at Four Continents, they now turn their focus to the 2013 World Championships next month. “As the season has progressed, we have gotten stronger and stronger,” Bates explained. “Worlds is the culmination of the full season and all of our hard work. Our goal is to have the best two performances we have had all season and carry that momentum into the Olympic year. Maia Shibutani and Alex Shibutani were edged by just a half a point to finish in fourth place. The outstanding Japanese crowd helped the team get through their performance as they were the final skaters of the event. Marissa Castelli and Simon Shnapir maintained bronze medal position by executing a strong free skate. They totaled a season’s best 117.04 points for the segment and reached 170.10 for the week. The newly crowned U.S. pairs champs now look to the World Championships where they hope to incorporate more difficultly into their program. Finishing three points behind their teammates were the 2013 U.S. bronze medalists Felicia Zhang and Nate Bartholomay with 170.30 points. The duo, in their first championship event, were clean with the exception of a fall on their throw triple Lutz. They will take the learning experiences of this championships into next season. Two-time reigning Canadian champions Meagan Duhamel and Eric Radford stood atop their first international podium. Their significant lead after the short program helped lift them to the first-place finish over teammates Kirsten Moore-Towers and Dylan Moscovitch, who won the free skate. The third American team of Alexa Scimeca and Chris Knierim withdrew before the short program as Scimeca was experiencing pain in her right foot. In the ladies event, Japan owned the podium. Mao Asada won her third Four Continents title with ease. Her total score of 205.45 points was 15 points higher than that of silver medalist Akiko Suzuki. Kanako Murakami rounded out the top three with 181.03 points. Christina Gao finished fourth as she earned her best overall score of the season with 176.28 points. She suffered a fall on her triple Lutz but otherwise turned in a strong free skate. Gracie Gold, in her ISU senior championships debut, placed sixth. She looks forward to taking some time to rest before diving into training for the world championships. Agnes Zawadzki, who finished eighth with 158.99 points, expressed her disappointment in her experience at Four Continents following her free skate. However, she is ready to prepare for next season with the goal of becoming more consistent. “I would like to put out stronger programs than what I did. It’s a good learning experience, I can always use it for next year,” she said simply. Newly crowned U.S. champion Max Aaron, didn’t disappoint as skated a strong free featuring a pair of his signature quad Salchows. His free skate totaled 162.19 points, en route to 234.65 overall. He finished fourth overall and second in the segment. Richard Dornbush also set a season’s best score in the free skate with a score of 151.03 points. He finished directly behind Aaron in fifth. His season now over, Dornbush will take some time to regroup with the plan of “training as hard as I can the whole way through” the upcoming Olympic year. Ross Miner suffered some mistakes in his program and placed ninth. He looks forward to refocusing as he heads into worlds in March. Next up for Team USA are the 2013 ISU World Figure Skating Championships set for March 10-17, in London, Ontario, Canada. The first medals were awarded Saturday, with Canada’s Kevin Reynolds coming out as a surprise champion. The gold was his second international medal at the senior level (he won bronze at this event in 2010). Also Saturday, Team USA’s ladies turned in a trio of solid short programs. The finals in pairs, ladies and ice dance are set for Sunday with Team USA in medal standing in all three events. Christina Gao is the top-ranked American and sits in fourth place. Gao turned in her best short program of the season to earn 62.34 points. She is in fourth place behind Japan’s Mao Asada, Akiko Suzuki and Kanako Murakami. Asada’s lead is nearly nine points, but only eight points separate skaters two through eight. Gracie Gold is in fifth place with 60.36 points. As recent history shows, Gold is capable of putting up big numbers in the free skate. Agnes Zawadzki, in seventh place with 57.35 points, fell on her double Axel, but noted her growing confidence in the triple-triple combination. Meryl Davis and Charlie White, five-time U.S. ice dance champions, sit in a close second place behind Canada’s Tessa Virtue and Scott Moir. Less than half a point separate veteran teams. Virtue and Moir set a season best of 75.12 points, as did Davis and White who have 74.68 points. Virtue and Moir earned a slight technical edge, something White acknowledged after the short dance. Madison Chock and Evan Bates, in their first Four Continents together, are in third place, followed closely by teammates Maia Shibutani and Alex Shibutani. Marissa Castelli and Simon Shnapir are in third place behind a pair of Canadian teams in the pairs event. The newly crowned U.S. pairs champs recorded 53.06 points. They suffered a fall on their throw but otherwise turned in a strong skate. Right behind Castelli and Shnapir are the 2013 U.S. bronze medalists Felicia Zhang and Nate Bartholomay with 52.98 points. In the lead are two-time reigning Canadian champions Meagan Duhamel and Eric Radford, who earned a big 70.44 points. Their teammates Kirsten Moore-Towers and Dylan Moscovitch recorded the second-place score of 66.33 points. The third American team of Alexa Scimeca and Chris Knierim withdrew before the short program as Scimeca was experiencing pain in her right foot. Zhang and Bartholomay: 11:38 p.m.
Castelli and Shnapir: 11:46 p.m.
Ladies Free Skate: 1:30 a.m.
Davis and White: 7:52 a.m.
Chock and Bates: 8:15 a.m.
Shibutani and Shibutani: 8:23 a.m. While you were sleeping, competition began in Osaka with the short dance and pairs and men’s short programs. Team USA is in medal standing in both the dance and pairs events, which are set for a Sunday finale. Richard Dornbush is in third place going into Saturday’s free skate. Richard Dornbush blew away his season’s and personal best international scores by 13 points and totaled 83.01 points for the segment. Short program leader and hometown hero Yuzuru Hanyu has a two-point lead over Han Yan of China. Japanese star Daisuke Takahashi is in fourth place. Five points separate Hanyu and Takahashi. Dornbush was a late addition to the competition. His training as the first alternate came in handy when, on Sunday, he received word that Adam Rippon had withdrawn from the event. Ross Miner also set a season-high score of 74.01 points. He sits in ninth place. Max Aaron, with a score of 72.46 points, is right behind Miner in 10th. Aaron and Miner, who finished 1-2 at last month’s U.S. Championships, will represent Team USA at March’s world championships. Coming late Friday into Saturday are the ladies short program and men’s free skate. Men’s Free Skate: 3:55 a.m.